The warmest months of the year see the betting world gather at the San Sebastián Racecourse. 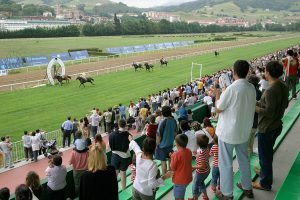 Horse races, and particularly the Copa de Oro (Gold Cup), one of the races in the prestigious Le Defi du Galop competition, attracts hundreds of spectators who come to have a good time and place bets on these exciting summer afternoons. On June began the season, horse-racing enthusiasts can’t miss this meeting!